Hansberry Garden depends on the love and attention of volunteer workers, especially its members. There’s plenty of work to do, and it yields great rewards, including the knowledge that we’ve contributed to beautifying our neighborhood, nurturing pollinators that are necessary to the survival of plant life, and providing education and entertainment to people in Northwest Philadelphia and beyond. ﻿Work days (Tend the Garden Days): each member household should participate in at least three of these days, which occur on the second Saturday of each month except May (because May 11 is the day of our annual plant sale). At work days, a sign-in sheet will be provided for participants, and garden officers will use those sheets to enter your hours into the book. Committee or event work: Each household should contribute six hours to a committee or special event. Unless a sign-in sheet is provided, you are responsible for entering these hours into the book. Routine maintenance work: Each household is expected to contribute 10 hours to regular tasks such as picking up trash, taking out the trash and recycling, mowing, trimming weeds, watering the fruit trees, and other jobs that need to be done periodically. You are responsible for entering these hours into the book. Some members regularly exceed the required number of hours. That’s great! We’d love it if you continued to record hours even after you’ve met the requirements. There are additional lines on the back of your garden bed’s front page. If you fill up that page, there are additional blank pages at the back of the notebook. Bring one forward right behind your bed’s sheet, put your name and bed number on it, and keep recording your hours. 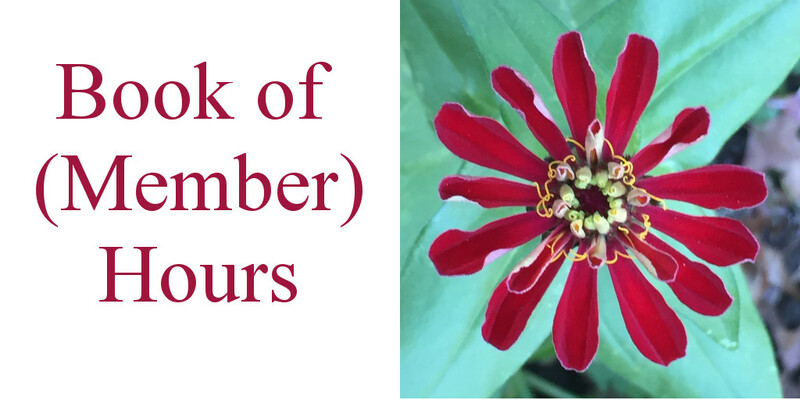 We want to keep track of all the hours our members donate to the garden because showing potential donors that we have a strong, committed membership can help establish that giving to Hansberry Garden is worthwhile.